The FLYING FIFTY was designed in 1950 for Gerald Ross for cruising the Carribean. She was built in Scotland, overseen by an up and coming naval architect Colin Mudie. She has recently changed hands via a broker in Florida. (The advert) 72' UFFA FOX KETCH/PILOTHOUSE Single 160hp MANN-DIESEL 6 CYL. 4 Staterooms, 3 heads, 2 showers and tub. Ketch rigged for cruising w/Roller Furling on head sail, main and mizzen. 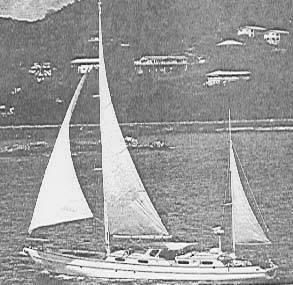 Wood main and mizzen masts were replaced in 1989 w/aluminum Roller Furling masts. This is a classic motorsailer with 8' headroom in the main salon and unique afterdeck that provides comfortable lounging and recreation area for diving and fishing.